Parcelforce Worldwide is sending customers from Chatham all the way to Crayford to pick up their undelivered post rather than letting them get it from five miles down the road in Gillingham Business Park. 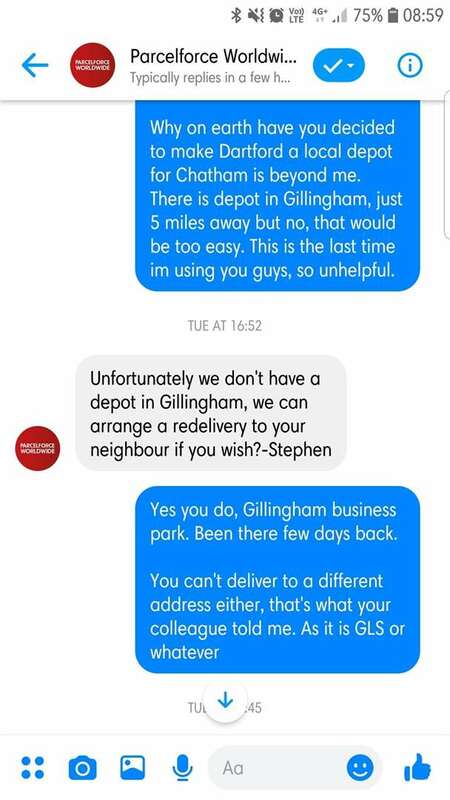 Jacek Pawlowski messaged the firm's Facebook account to ask why but was left bemused when a member of staff told them there is no depot in Gillingham, despite the facility being listed on the company's website. Mr Pawlowski, an NHS analyst, said he was told by another member of staff the allocation had changed four years ago and since then Chatham residents have been sent the 21 miles to Crayford. The dad-of-one, of King George Road, Walderslade, said: "I am no longer questioning Parcelforce's reasoning for such depot allocation and I have accepted that I wont be able to convince them that Gillingham is closer to Chatham than Crayford is. "Maybe it's because they don't even acknowledge Gillingham's existence. "I used to drive past it every day so can confirm it definitely does exist." The issue came to Mr Pawlowski's attention after a trip to Poland. He travels to his homeland three or four times a year with partner Magdalena Morton and daughter Audrey, seven, and regularly sends larger items back as its more convenient and cheaper than paying for extra luggage. Miss Morton, a sales rep, added: "It's never been a problem before when we've used other companies but this time my parents decided to use Parcelforce. "We've had terrible trouble getting hold of someone, speaking to an actual person is impossible, it's like they are trained not to help you." Parcelforce failed to explain why Chatham residents were sent to Crayford or why its staff failed to acknowledge Gillingham's existence. It did say it "always aims to deliver first time" and if a customer is not in, will attempt to deliver to a near neighbour or leave the parcel at the local post office. It added: "If a customer is not in, we will attempt to deliver to a near neighbour or leave the parcel at the local post office. Otherwise we will return the parcel to the depot where it came from. In this case, the parcel was returned to our London South East depot in Dartford. If a depot is not convenient for our customers, we are happy to arrange a redelivery at no additional charge." The company said it believed the mistake surrounding the Gillingham depot's existence was down to human error and was investigating. My local one's Crayford after they shut my local local Charlton one, I'll meet her there. Seems they have shut a s**t ton of them.